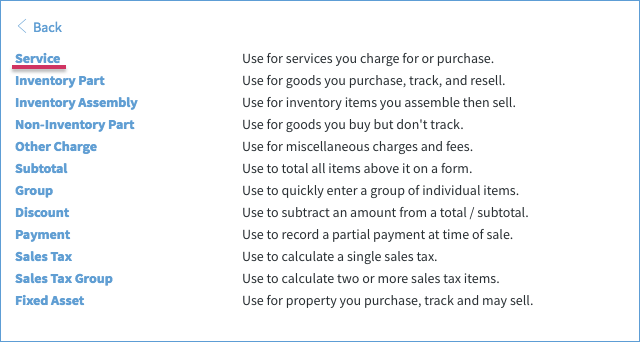 This item type is used for services your company either charges a customer for, or purchases from a vendor. Note: This item is available in QuickBooks Desktop and QuickBooks Online. 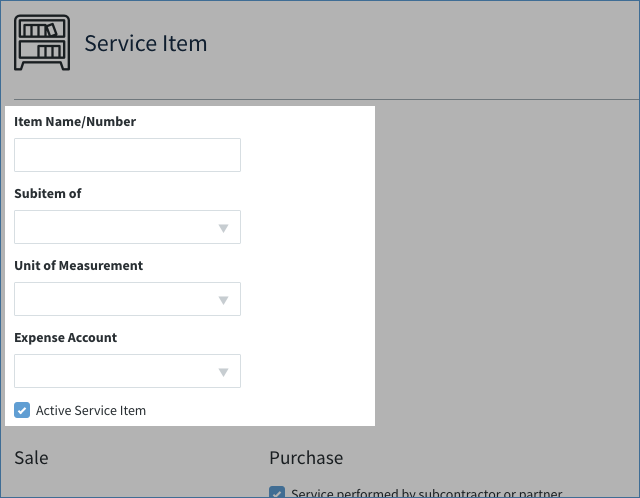 To add this as an item, you will need to add a new item within the Items app, and choose Service. If you do not see the Items app, you will need to get access permission for this app from your administrator. The Items app is found in the Accounting Lists Pack. When you select Service, you'll be taken to the New Item Screen. The fields are described below. Item Name / Number: Identify the service by name or by number. Subitem of: Choose an existing item to associate with this item from the drop down list (e.g. "cleaning out gutters" might be a subitem of "landscaping"). Unit of measurement: How is your service measured (for example, hours, days, etc.)? The options in this drop down list come from your QuickBooks. Expense Account: Choose which account is associated with the customer payment. These options come from QuickBooks. Active Service Item: Click this option to ensure this item appears in the "Active" filter view in the Items list, and so it will also appear in dropdowns. Sales Description: Include descriptions of what has been purchased or sold. Use it to include additional information that isn't covered in other fields on this screen. Sales price: The amount your company charges for this item, in dollars. Tax Code: Choose whether or not this sales amount is tax-applicable. Income account: This account drop down list, populated from QuickBooks, allows you to choose which account will be associated with the customer payment. 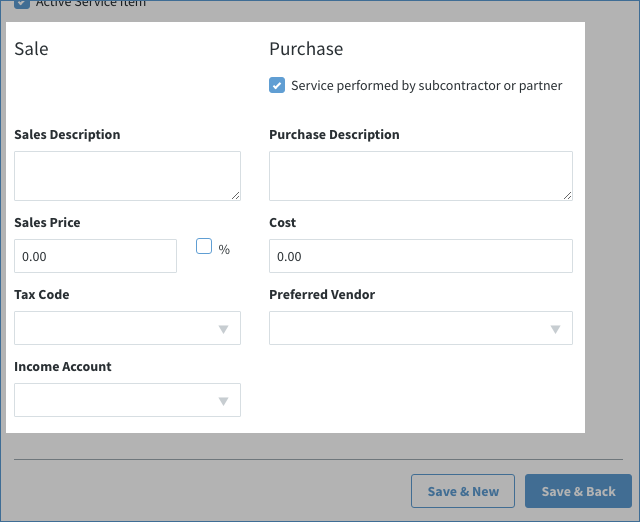 Service performed by subcontractor or partner: Flags this record in QuickBooks as being subcontracted out to a third party and makes the purchase fields visible. Purchase description: Include a description of what item was purchased. Use it to include additional information that isn't covered in other fields on this screen. Cost: The price of the item purchased in dollars. Preferred vendor: The vendor from whom you most commonly purchase this item. The list is populated from your QuickBooks account. Save & New: Saves the new or edited item and clears the fields above. Save & Back: Saves the new or edited item.